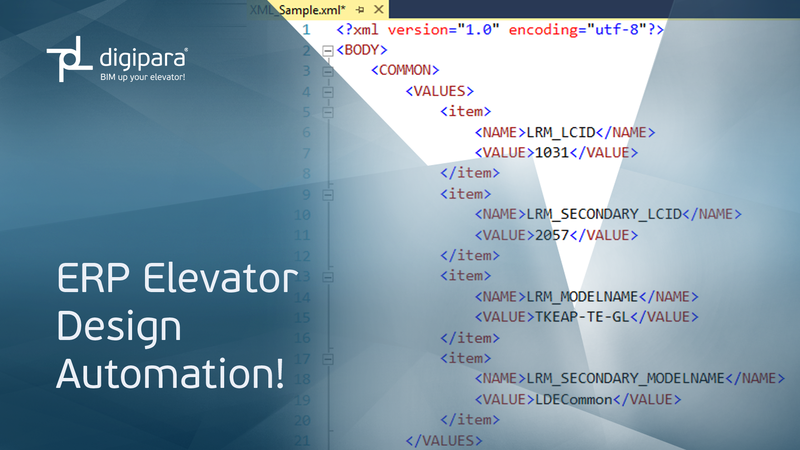 In times of standardization and process optimization, elevator manufacturers around the world use DigiPara® Liftdesigner to fully automate their drawings. Whether rope or hydraulic elevator, whether modernization or new installation – with the help of predefined parameters, components and logic the intelligent elevator configurator provides efficient planning and the configuration of elevators and escalators. 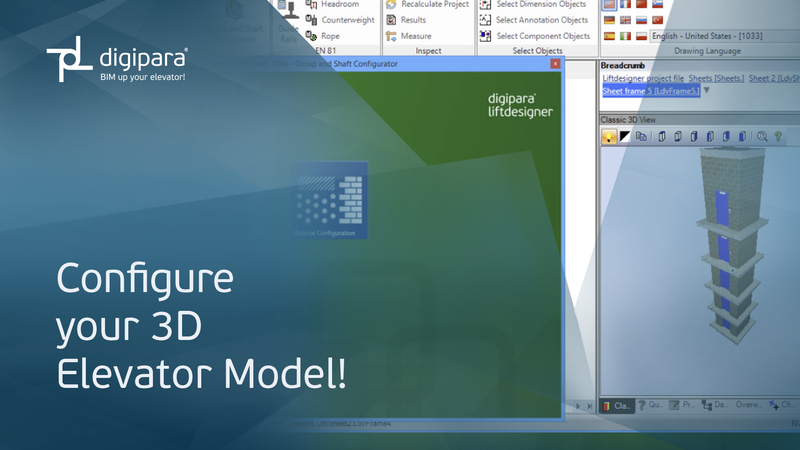 Users benefit from this stand-alone Windows application and don’t need any additional CAD programs. Three-dimensional planning is the way to go nowadays. DigiPara Liftdesigner makes it possible to configure elevators and escalators as complete 3D models with just a few clicks. Both components of the existing database and your own CAD models can be customized to any size and calculated. Thus, the shaft wizzard can be used to create individual elevators as well as elevator groups which can be passed as 3D data in production. In addition, architects can add 3D BIM elevator models, which were supplied by manufacturers, into their Revit buildings. Especially when working with CAD software, you will want to process already created data in different departments. 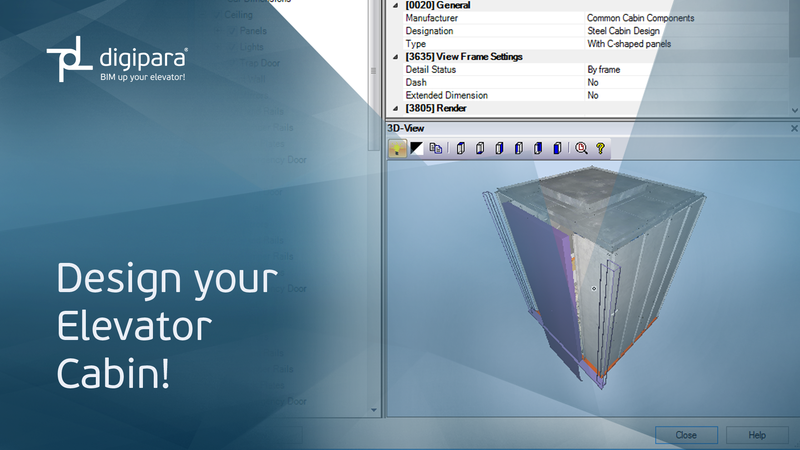 Loading CAD models from PTC Creo, Autodesk Inventor, and SolidWorks enables a smooth data exchange between the corresponding CAD programs and DigiPara Liftdesigner. Individual changes are immediately updated and data reliably transferred to the native CAD data. Every 3D elevator model in DigiPara Liftdesigner also includes the 2D drawings, which are required for the installation. The software allows you to create your own drawing sheets with title blocks and drawing frames. 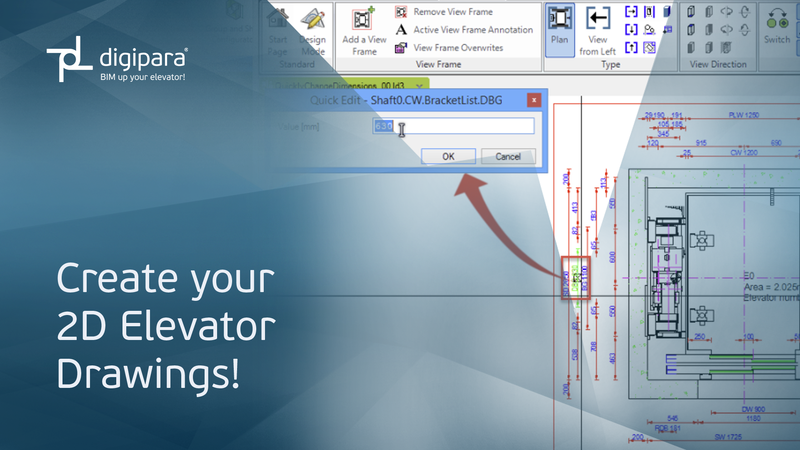 Different views are possible as well as inserting and using DWG title blocks. Changed dimensions are immediately adjusted in all views so that errors in quotation and installation drawings don’t arise. Reusing existing projects and sending them as PDF or DWG to colleagues or customers prevents unnecessary data breaches or errors. Three-dimensional planning and presentation of elevator cabins makes ideas tangible. The photo realistic visualization brings the design to the point and convinces potential customers. Individual materials, people, photo realistic lighting and mirror effects within the DigiPara Lifdesigner cabin configurator illustrate the cabin at your fingertips. Also, the creation of cabin approval drawings becomes a breeze with the cabin configurator. The construction of elevators and escalators with all the necessary components is very complex. 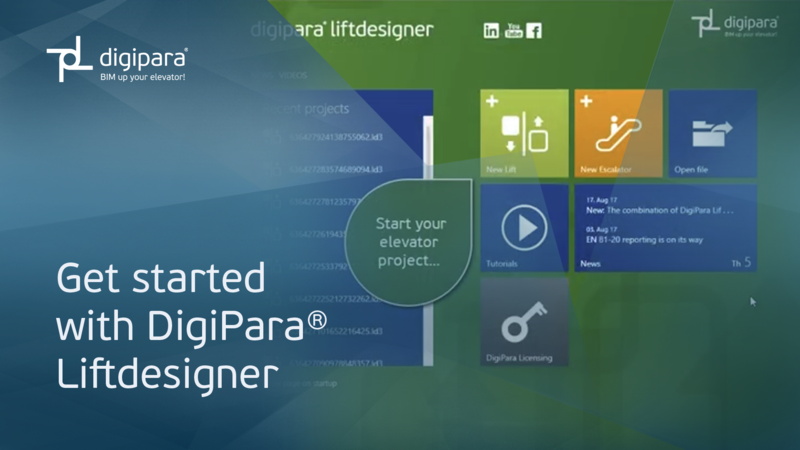 In order to save time and money, DigiPara Liftdesigner supports the standardization of the development process. 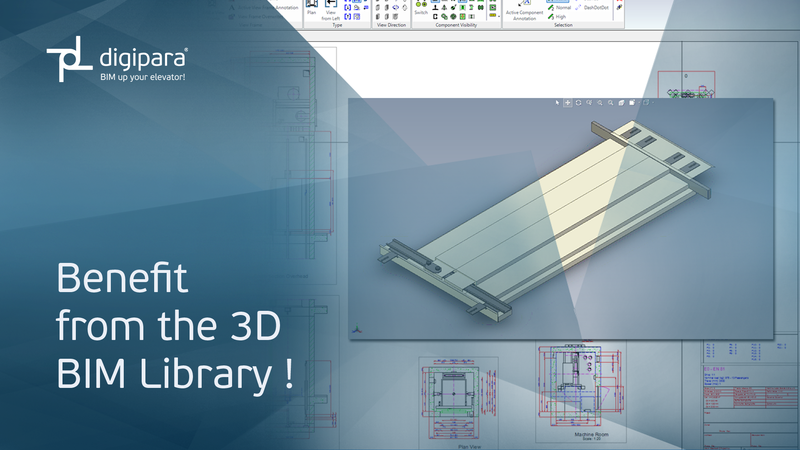 Users can replace neutral common components with a click through manufacturer-like products via the extensive 3D BIM library. Even the DigiPara Liftdesigner Free Edition provides certified data via a configurator and offers the ability to export matching components directly and deliver them to other departments or partners without data breaches. The intelligent elevator configurator already has a gigantic 3D BIM library with manufacturer-like products. But – many manufacturers have to integrate their own components into their elevator planning. 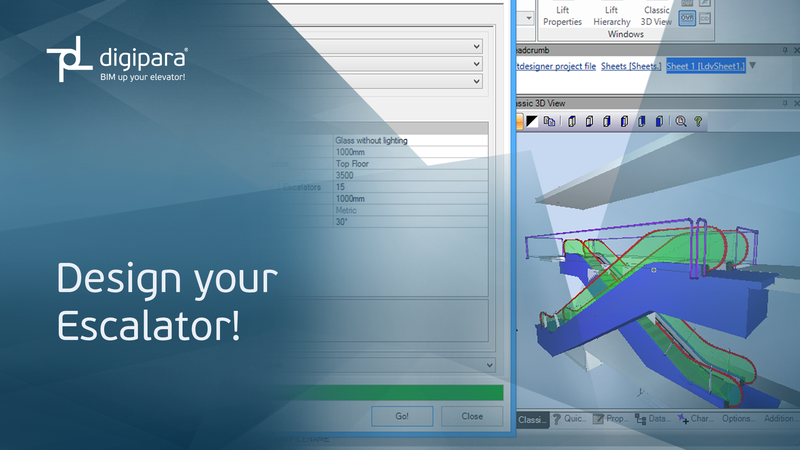 DigiPara Liftdesigner enables both the development of individual components as well as loading CAD data for further planning. These models can then be stored in the library for your own purposes as well as to other users. As a result, the software also offers a marketing platform for your own products. The planning of larger buildings often requires escalators, ramps and moving walks. With the help of the DigiPara Escalatordesigner, users can adapt the escalators in the existing building with all common arrangements. The configuration of escalators and ramps are extremely simplified. Individual solutions can be added, if required. The manual construction of elevators and escalators and the exchange of data between departments can cause errors. 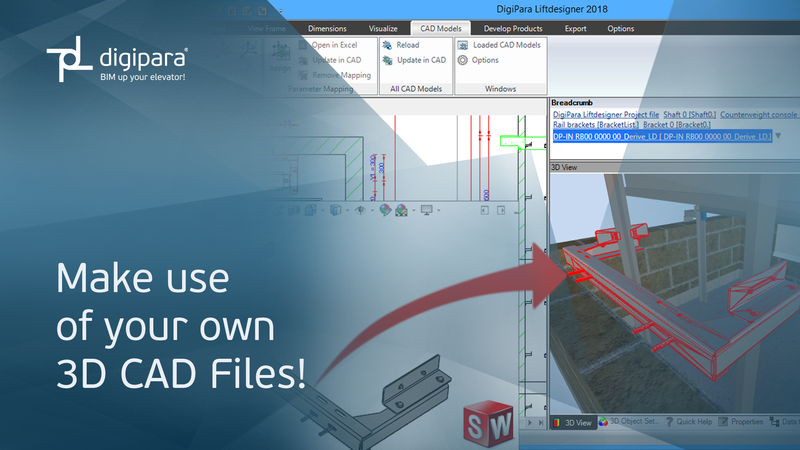 The integration of DigiPara Liftdesigner Automation via individual interfaces in ERP enables drawings and 3D BIM models to be created automatically. Through this simplified sales process, sales will increase dramatically. Elevator planners and architects are online today and they expect to be able to solve their requirements on the move. 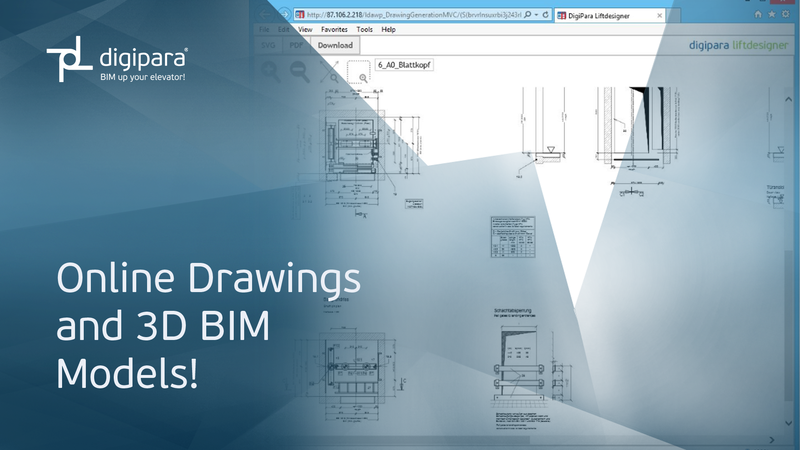 The DigiPara Liftdesigner Automation Web Plugin (LDAWP) allows users to access, view and download drawings and 3D BIM models 100%, anytime and anywhere. LDAWP is easy and quick to install. The data is available in the cloud. A contemporary channel for even more sales.